Stunning Silver Proofs That Are Fit for a Queen! Few French queens, let alone world monarchs, have led the whirlwind life that Catherine de Médicis experienced. Born into one of Italy's most famous noble families, Catherine was married at the tender age of 14 (by her uncle Pope Clement VII) to Henry, duc d'Orléans and son of King Francis I of France. Just 14 years later, Henry became King Henry II and Catherine the Queen Consort. In the 42 years that followed, she would see all three of her sons rule France and have an extensive influence in the turbulent affairs of her adopted country. However, Catherine was more than just a political force -- her love of architecture and food helped to shape French culture long after her passing. Now, as part of the Paris Mint's "Women of France" series, this powerful figure in history is being honored with her own Silver Proof! Rich Details Shine with Perfect Imperfection! No, that's not a contradiction! The artisans of the Monnaie de Paris have given this silver proof a distinctive shape that beautifully reflects Catherine's time. 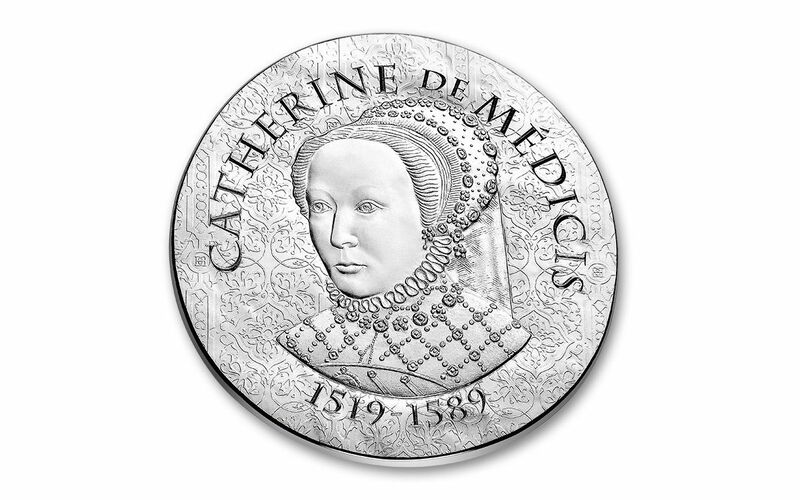 Proof-minted in 90% pure silver using polished dies and hand-selected planchets, this legal-tender 10 euro coin exhibits the profile of Catherine de Médicis in front of an intricate Chateau de Blois tapestry. Turn the coin over and you'll find two enduring symbols of Catherine's passions. First, you'll discover the artichoke, introduced to France by Catherine. Second, you'll see the magnificent Chateau de Chenonceau, designed by Catherine yet unfinished during her lifetime. Both are set against a pattern of interlocking letters, C for Catherine, H for Henry II and D for Henry's mistress Diane de Poitiers. But, what truly makes this coin special is its hammered look, providing beautiful detail in a slightly imperfect round shape -- ironically, a perfect complement to this amazing design! A Limited Mintage, a Regal Collection Addition! 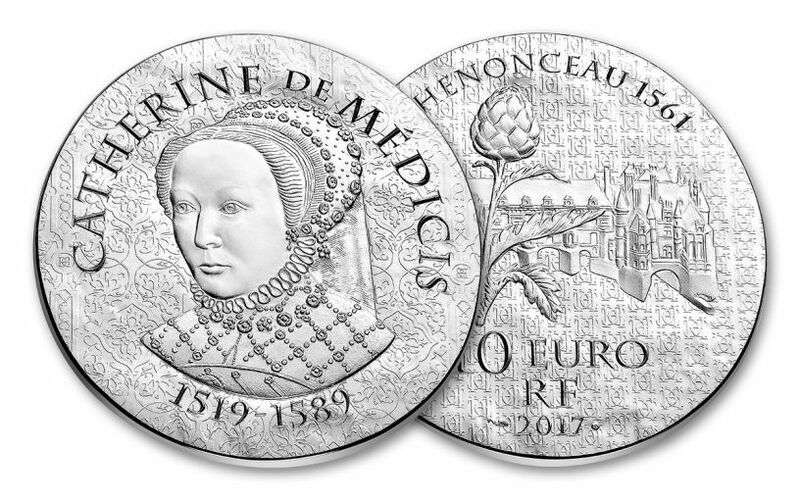 Your 2017 Catherine de Médicis Silver Proof will arrive to you in the exact same condition it possessed when it left the Paris Mint. 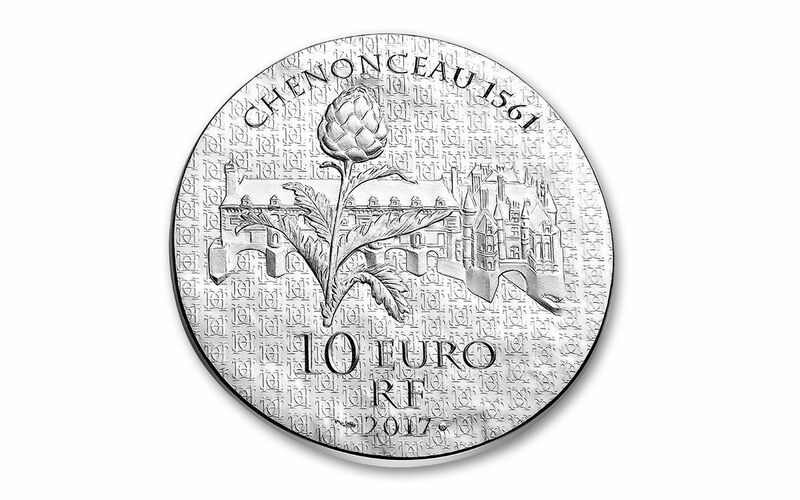 Only 5,000 of the historic proofs will be minted -- a small number when you consider a world full of coin collectors and fans of European history! Don't let time steal your opportunity to own this royal coin. Order yours now!